Australian cricket saw what could be considered its best summer last year – the last one came against India just a couple of short years back. Breaking down the constituents, one topic of interest has seemingly plagued journos, critics and fans alike; why is there so much talk about the choice of a front-line spinner? Nathan Lyon more than aptly showed why the Australian selectors have kept confidence in him; his Ashes record of 19 wickets at 29.36, with a best bowling of 5/50, belied the true work ethic of the off-spinner. An economy rate of 3.16 from a mammoth 176.2 overs, including 42 maidens, was what allowed Australia to create such an extreme stranglehold in tandem with the fast bowlers. Next question then is; with Lyon at the top of his game, a) who else is coming through the ranks, and b) will the New South Welshman continue to hold his place? Let’s have a look at those that are getting blooded. James Muirhead is probably at the top of that list. He’s 21 in at the end of July, but it is his early development at state and national level, along with his amazing temperament, that has surprised most. The likes of Nathan Hauritz, Beau Casson, Stuart MacGill, even Brad Hogg – to name a few – were given a test cap in the time of superstar Shane Warne. While that is going back into last decade, it highlights the point that there was an abundance of off and leg-spinners that could have potentially taken up the reins at any time. MacGill, with 208 test wickets in 44 matches, was the most successful of the aforementioned four; but now, the situation has changed. There’s one frontman, and no marching band to really follow. The Centre of Excellence (CoE) is pushing through the new players, but the opportunities are either vanishing or not being given. Back on Lyon, he is no full-on, rage-turning bowler. Flight is his ultimate weapon, deceiving batsmen with line and length. 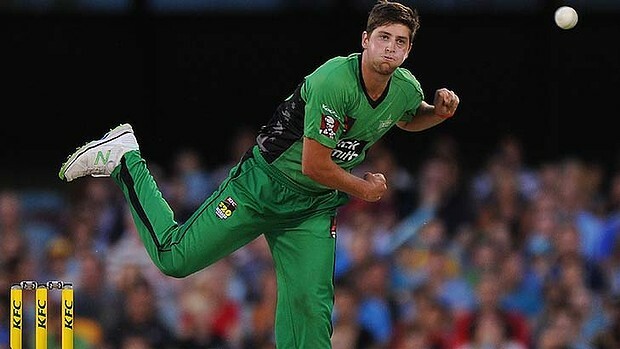 Muirhead has also got those tools, but he can also get some genuine rip – and showed it to those watching the Australia v England Twenty20 games this past summer. Some might argue spin is a dying art, but then you only have to look at, since 2008, the records of Graeme Swann, Saeed Ajmal, and later, Rangana Herath. All of these players proved to be a pivotal part in some of their sides most convincing and gritty victories. Unfortunately, here in Australia the pathway is stifled; not stopped, but just slow. Hauritz was thrown the gauntlet at times (63 wickets at 17 matches), and despite being in and out, just wasn’t given the opportunity to launch into full flight. Granted, Hauritz was not able to strike at some key moments, but it does not undervalue the impact he made. While Lyon has now moved onwards and upwards, he too was in Hauritz’s type of position for a while. No, the answer lies in coaxing the spinners, gently but firmly. The very recent appointment of Shane Warne and Muttiah Muralitharan as spin consultants for Cricket Australia will give the future generation someone to look up too. Right now, though, the ball game rests with Lyon, and perhaps Muirhead, once he has put another season under his belt. Twenty20 was the perfect form to introduce him to the international game, and not throw him straight in the deep end with a test match. There’s Cam Boyce (23 in a few weeks), but the list is still small. Australia, in this case, is spinning its way into the unknown immediate future.